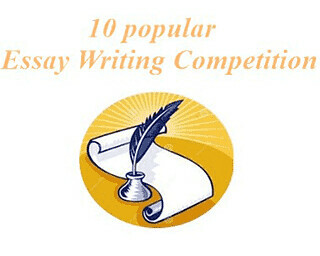 Ten famous Essay Writing Competitions are mentioned in this article; every competition has a different pattern with various prizes. The essay writing competitions are organised for developing knowledge and motivating the masses on a particular topic. The essay competition 2018 is also crucial for the young generation to explore their thoughts & imagination and develop their understanding of a particular topic. Through these essay competitions, students will enhance their thinking ability and problem-solving skills, which is important for our Nation. There is proven track record that lots of solutions for Nation related problems are provided through these competitions. Scroll down for the list of Essay writing competition 2018. The list contains the essay writing competition which is generally organised by some department of Govt. of India or some reputed organisations and is organised on ever year basis. The Babu Jagjivan Ram All India Essay Competition is organised by “The Babu Jagjivan Ram National Foundation”. This foundation is established by the Government of India as an autonomous organisation under the Ministry of Social Justice & Empowerment. The main objective of this organisation is to promote the scheduled castes and weaker unit of society. Every year this foundation organised All India level essay competition. Dr Ambedkar Foundation organises Dr Ambedkar National Essay Competition. The primary objective of this foundation is to implement the programs and activities for spreading the ideology and message of Babasaheb Dr B. R. Ambedkar to the masses across the globe. Whole life Dr Ambedkar worked for weaker section of society on various issues such as social justice, removal of inequality and discrimination, ameliorating the conditions of weaker sections of the society, removal of untouchability, caste-based prejudices, disparities, equality of opportunity, social democracy, etc. Aligarh Muslim University organises Sir Syed All India Essay Competition for the student of recognised Colleges/ Universities. The primary objective of this essay competition is to spread modern scientific education among students. This essay writing competition organised every year only in the English language. Candidates are informed that there is no entrance fee for this essay writing competition. All India Essay Contest on Nuclear Science & Technology is organised by The Department of Atomic Energy (DAE). Students who are pursuing graduation in any discipline in India can participate in this essay writing competition. The topics of this essay contest are based on the Nuclear Science & Technology. Candidates who have earlier participated and won any prize in the essay contest are not eligible for this competition. Candidates can write the essay in English language or any official Indian language within preset word limit of 2000. UNESCO Essay Writing Competition is organised by the GOI Peace Foundation. It is an international essay writing competition for the young generation. The main objective of this essay contest is to bring people in wisdom and united their hearts toward the common goal of peace on Earth. This foundation also works for building cooperation among individuals and organisations in all fields, including education, science, culture and the arts. GOI Peace Foundation is also focused on inspiring society to learn from the young minds and to think about how we can make a difference in the world. Candidates up to 25 years old can participate in this essay competition. Petroleum Conservation Research Association (PCRA) Essay Writing Competition is organised only for those students who are learning in schools in India recognised by Central & State Boards of India. This competition conducts in various languages such as Hindi, English, Konkani, Bengali, Gujarati, Kannada, Kashmiri, Marathi, Assamese, Malayalam, Manipuri, Oriya, Sanskrit, Sindhi, Tamil, Telugu, Urdu, Maithili, Punjabi, Dogri, Nepali, Bodo and Santhali. It must be that minimum 15 students have to participate in each language in which the school submits its entry. Only students of classes 8 to 10 are eligible to participate in this contest. The student will be given one hour to write an essay; it is to be noted that the essay should not exceed 700 words. Students are informed that they have to submit the essay in their handwriting. The shortlisted essays send by the school and then will be examined by the jury appointed by Petroleum Conservation Research Association. On the Spot Essay Writing Competition is organised by The Ministry of Statistics & Programme Implementation (MoSPI). This year on the spot essay writing competition is held for Post-Graduate Students of Statistics. MoSPI will organise an essay writing competition on subjects relevant to Statistics as part of the celebration of Statistics Day. The participant will get two topics for the essay on the spot. The essay should be written on one of the topics in about 5000 words in the prescribed preset word limit of 3000. On the basis of originality of ideas, Sequence of presentation and writing skills, the essay will be examined by a committee constituted by MoSPI. Winners’ names will be displayed on the official website of MoSPI. UNIC All India Essay Writing Competition is organised by United Nations Information Centre for India and Bhutan association with Shri Ram Chandra Mission a non-profit, educational and spiritual service organisation. This essay writing competition is organised each year in several educational institutions across the country on the celebration of International Day of Youth i.e. August 12 every year. UNIC All India Essay Writing Competition has two categories of participation and students have the option to choose their language of writing such as English, Hindi or one of the 9 approved regional languages of India- Bengali, Marathi, Telugu, Tamil, Oriya, Malayalam, Kannada, and Gujarati. The length of the essay should be 1000 words for each category. The winners of both National and Zone level will be awarded medals as well as all certificates signed by the Director of the UNIC and the President of SRCM. The Tata Building India Online School Essay Competition is organised by the Tata group of Companies. The main objective of this essay competition is to motivate the young generation of India towards thinking about nation building. The students can participate in this essay contest only once in an academic year. The essay should be written by the student only once, and it will be evaluated at three levels such as School, City and National level. The candidates, who are willing to participate in Tata Building India Essay Competition, informed that there is no entry fee for this contest. This essay contest would be organised across 180 cities, 7000+ schools and will cover approximately 3.5 million students and scheduled to be held in 12 languages. The winning candidates of school, city and national level will be awarded Certificates and Fabulous prizes. The students of Junior Level Class 6 to 8 and Senior Level Class 9 to 12 are eligible for this essay writing competition. The student will be given 90 minutes to write an essay; it is to be noted that the essay should not exceed 1000 words. The Living Rainforest Essay Competition is organised and run by the Trust for Sustainable Living. The mission of the trust is to provide high-quality education and enhance the knowledge of school students about the living rainforest which is home to 700 species of plants and animals. The topics of this essay contest will be based on the Climate. Those students who will win the prize (1st Prize -5th Prize) awarded trophies at the TSL International Schools Debate, and their essays will be published on the competition website. The International Schools Debate & Prize giving will take place at the Oxford Union, Oxford, UK. All Paid Trip to the UK: The Grand Prize winners along with the parent, plus one Teacher Champion will be awarded a free trip to the UK. If you have any query related to Essay Writing Competitions, you can write to us in the comments section below.